Humble & Fred morning show (1989 - April 2001). Left CFNY for CKFM in 1991, returned in 1992. Left CFNY with Fred Patterson in April of 2001 to do the morning show at Mojo 640 (what used to be Talk 640). Humble and Fred have now moved to Mix 99.9 in Toronto. Humble now let go by 99.9, as Fred was last fall. Not currently on the air. Humble now has his own web site , as well as posting monthly podcasts with Fred on their web site . April 2010: Humble now has the morning drive slot on Toronto's Boom 97.3 . October 2011: Humble and Fred have started a new podcast at http://www.humbleandfredradio.com . June 2012: Humble & Fred have joined K-Rock 105.7 in Kingston to fill-in on the morning show for the summer. 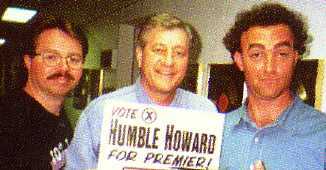 January 2013: Humble and Friend announced a deal with Astral Media, airing a new comedy show on CHAM in Hamilton and CKSL in London, as well as on CFRB in Toronto, with potential for syndication to other stations. May 2013: Humble & Fred can now be heard on SiriusXM comedy channel Canada Laughs weekdays from 7-9 am.